How much does it cost to travel to Dubai? How much money will you need in Dubai? AED1,058 ($288) is the average daily price for traveling in Dubai. The average price of food for one day is AED164 ($45). The average price of a hotel for a couple is AED990 ($270). Additional pricing is in the table below. These average travel prices have been collected from other travelers to help you plan your own travel budget. How much money do I need for Dubai? Ever wonder what it would be like to see the lifestyles of the rich and famous up close. There's no more upscale destination than Dubai. It's by far and away the spot for shopping, partying, sunbathing, fine dining and the most luxurious of luxury. As the most modern and progressive of the seven emirates in the United Arab Emirates, this area has experienced an unbelievable economic boom and tourism spike. It's a desert city with an amazing infrastructure. The area experiences a sub-tropical climate. It gets very hot and humid especially during the summer months. And keep in mind, their weekend runs from Thursday to Saturday. Remember to do your research. While Dubai is more modern and progressive than most of the Middle East, it is still an Islamic nation with strict laws unlike the West. They follow strict sharia laws so be sure to be very respectful. For example, do not eat in public during Ramadan, avoid criticizing the ruling family, and refrain from public displays of affection. Even losing your temper can land you in jail for a month. This massive and beautiful city is never lacking in sightseeing. You'll want to start your trip with a trip to the Dubai Museum. Here you'll learn about the social history of the Emirates and discover an appreciation for the deep culture and heritage of the city. As you browse the museum you'll see the al-Fahidi Fort and the quick transition the city has made from a small pearling town to a bustling metropolis. Another stunning view is standing in front of the Jumeirah Mosque. It's the largest mosque in the city and one of the few that is open to non-Muslim visitors. In order to promote a better understanding of Islam, the Jumeirah Mosque offers special, educational tours for non-Muslims. Go back alter that evening for a spectacular view of the mosque lit up at night. If you're not afraid of heights, take a trip to the observation deck of the Burj Khalifa. At 828 meters and 160 floors, that makes this the tallest structure in the world. If you want the opportunity to see the view on the observation deck on the 124th floor, be sure to reserve your tickets well in advance. For a relaxing, but fascinating show, visit the Dubai Fountain. The world's largest dancing fountain gives several shows a day to the sounds of classical and Arabic music. For a true look into how the better half lives, travel over to see the Palm Islands. These three artificial islands are the largest in the world. Located just off the coast of Dubai, these islands are designed in the shape of palm leaves. With so much to see and do, Dubai has a little bit of everything for everyone. For more information, check out this terrific guide to things to do in Dubai. 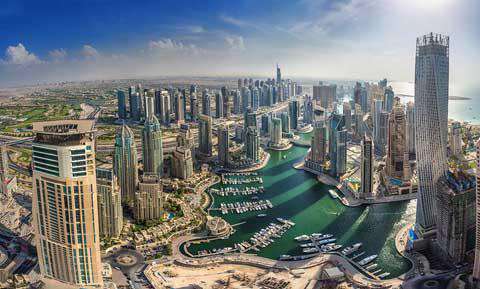 Dubai is divided into 11 districts, and some areas are more attractive to tourists than others. The Jumeirah district is the main destination for beach lovers. The beach is close by and easily accessible in this district. Downtown Dubai is located in the center of "New Dubai," and includes the world's largest mall, the Dubai Fountain and the tallest building in the world - the Burj Khalifa. The Dubai Marina is the home to numerous restaurants, homes and is where most of the Westerners will stay. Think of an activity you'd like to try, and Dubai can make it happen. One of the most popular activities is known as Dune Bashing - a form of off-roading on sand dunes. Many places will rent 4x4 safari Jeeps, sand boards, quad bikes and dune buggies so you can feel the thrill of this amazing outdoor activity. If you're in Dubai between late November and late February, you'll want to be sure to take a trip to the Global Village. This annual gathering of countries around the world is a makeshift flea market where you can pick up souvenirs from all over the world. Each country has its own pavilion with replicas of their most famous landmarks, and because this is Dubai, there is typically a raffle with prizes like cars and gold bars. And just because Dubai is in the desert doesn't mean you can't enjoy your favorite winter sports. Inside the Mall of the Emirates is a national skiing center, complete with real snow. They provide all the equipment you'll need to enjoy skiing and snowboarding. With all of these activities, as well as the cultural differences, you might be wondering what to bring and what you should wear (especially if you're a woman). Here's a great packing list for Dubai and an overview of what to wear. Because the tourism industry is so diverse, you can find almost any dish you're looking for in Dubai. The most common meals you'll find all over the place are the Shawarma and the Falafel. The Shawarma is the Arabic equivalent to a burger  the meat is cooked on a skewer, then cut into thin strips and placed in pita bread with vegetables and dressing. While Dubai has a very reliable and strong public transit system - including a metro system, Dubai trams and buses  much of the city still relies heavily on their own cars. You'll most likely end up taking taxis most places. No matter what mode of transportation you use, you'll want to invest in a Nol Card. This prepaid debit card can be used to pay for metro trams, buses, waterbuses, paid parking and taxis. They are available at metro stations and most major bus stations. Read more about where to stay in Dubai and the best hotels here. I went to Dubai, from 3 to 5 May 2012, is a lovely city, the part that struck me the most is the old part of town where you will find the gold market, spices and fabrics, and where you can dine alone 5 euro their typical dishes. I advise you to stay at least 4 days, so that they can calmly see all the attractions of the city, plus the portion of the new skyscrapers and shopping malls, I advise you to visit this part of the evening.